Early in the 1990s, with the arrival of Amazon and eBay, the Ecommerce market had been changed and came up with the new innovative idea of “Online Ecommerce business”. Today, we’re observing a new technology for transaction and related services with the exposure of blockchain technology. Covering nearly every industry, the blockchain provides new opportunities for marketplaces, changing how we make transactions online in our everyday life. Blockchain is the new innovative technology that consists of a decentralized ledger that records, verifies, and tracks cryptocurrency transactions and contracts between parties. A decentralized marketplace connects three group of users: producers, sellers, and consumers. 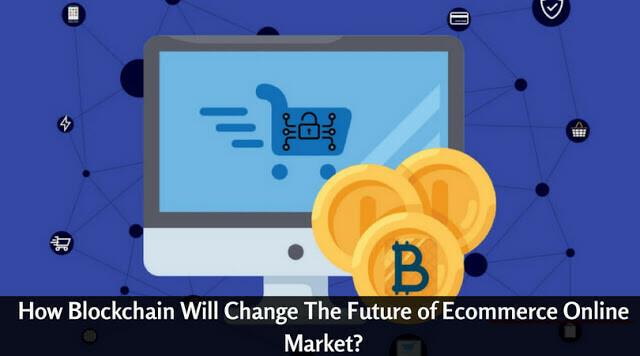 WHY ECOMMERCE MARKET NEEDS BLOCKCHAIN? The Ecommerce market is growing very fast. By 2020, Most of the businesses will depend on the ability to deliver products, services, and experiences in a friction-free way based on the evolving customer expectations. Values are nowadays calculated in bitcoin form, then Ethereum which is too in the race. Several eCommerce sites have already adopted the change and some have already started accepting such currencies. Soon, Cryptocurrencies like Bitcoin could well be the most accepted payment option for consumers. It’s better to be prepared. An eCommerce development company that is why considering this factor for sites, so their clients can easily enjoy the services regarding any currency. 1. For Secure Transaction: For any ecommerce related site, it is compulsory to have very secure and transparent transaction. Blockchain follows pocket based encrypted transaction which is very secure in every aspects. 2. Paper-Based Legacy System: Blockchain company never trusts paper-based transaction system, So it gives you a simple and easy way of transaction. 3. Manage High Volume Data: It always secures high volume data and manages it in very precise and transparent manner. A Blockchain development company brings you these qualities so that you can easily assure your data, with the collaboration of both can help in increasing reliability in every aspect. So future ecommerce sites will be secured and more reliable in every aspect.